Let everyone know your name in a classy way with a custom name badge holder. 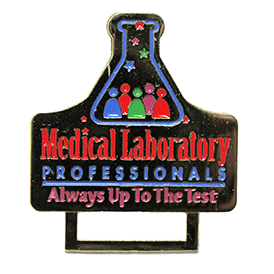 This name badge holder is made from high quality iron that is enamel color filled. We make name badge holder ordering fast, easy and straight-forward. Call for pricing, 300 piece minimum. Up to 4 soft enamel colors. Magnet bar backing is available for an additional charge. Standard Delivery is 4 weeks from receipt of usable artwork. Pre-Production sample is available for $130.00 (G) and rebated when full order is placed. Add two weeks to delivery time.